The last time the Minnesota Twins won a series in Anaheim, Rick Reed and Eric Milton were the winning pitchers. The last time the Minnesota Twins hit nine home runs in their first four games was...never. After dropping the season opener to the Los Angeles Angels 6-3 last Monday night, the Twins won the last three games of the series, outscoring the Angels 19-6. The Twins have jumped out of the gate with their league-leading nine home runs: OF Delmon Young, 1B Justin Morneau, and SS JJ Hardy all have two, and C Joe Mauer, DH Jim Thome, and IF Brendan Harris each have one. With his home run, Jim Thome is only eight home runs short of tying Hall of Famer and Twins great Harmon Killebrew for tenth on the all-time list. Twins five hitter RF Michael Cuddyer is leading the team with a .375 average (6-16), but doesn't have an RBI yet. With a number of Twins having hot starts, some players have had peculiarly slow starts, most notable CF Denard Span, 2B Orlando Hudson, and DH Jason Kubel. Span and Hudson, who hit first and second in the Twins lineup, are hitting a combined .121 (4-33), and Kubel is hitting .111 (1-9). Twins starting pitching (Scott Baker, Nick Blackburn, Carl Pavano, and Kevin Slowey) has gotten off to a strong start too, with a combined ERA of 3.32. Opening Day starter Scott Baker (0-1, 7.71 ERA) gave up four earned runs in five innings. Kevin Slowey, after his season was cut short last July due to a wrist injury, pitched Thursday night, giving up one run on seven hits in 5.2 innings and striking out three. The Twins bullpen has been solid as well. In the absence of Joe Nathan, who is missing the season due to Tommy John surgery, Jon Rauch has converted his first two save opportunities of the season. The Angels hit only .120 (4-25) against relievers Pat Neshek, Jesse Crain, Matt Guierrer, Brian Duensing and Alex Burnett. The Angels did tee-off on Jose Mijares, hitting two home runs off Mijares in 1.2 innings. Mijares did record two strikeouts, however. After taking three of the four games in against the Angels, the Twins won their first series in Anaheim since 2002. 2002 was also the year that the Angels beat the Twins 4-1 in the ALCS. Former Twin Torii Hunter, who left the Twins for the Angles via free agency in after the 2007 season, had a good series against his former team, hitting .385 (5-13), with a home run and three RBI. Hunter won his ninth consecutive Gold Glove and his first career Silver Slugger after hitting .299 with 22 homeruns and 90 RBI in 2009. 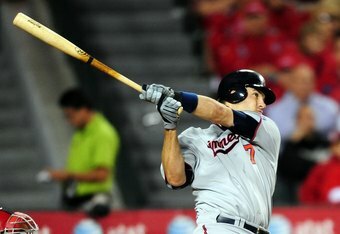 There was some skepticism when the Angles signed the 31-year old Hunter to a five year deal in 2008. After the first two seasons in California, Hunter is hitting .287 with 43 home runs, 168 RBI, and appearing in 265 games. Hunter was elected to the 2009 All-Star team, but wasn't able to play due to injury. New York Yankees' World Series MVP Hideki Matsui, a notorious Twins killer now with the Angles, continued his tear against the Twins. Matsui hit .400 (6-15) against the Twins with a game-clinching home run in the Season Opener. Matsui is a career .333 hitter (47-141) against the Twins with seven home runs and 28 RBI. The Twins have never hit nine home runs in their first four games, which is surprising given the nature of their power teams of the 1960s featuring Harmon Killebrew, Bob Allison, Tony Oliva, and Zoilo Versalles. The Twins have averaged only 147 home runs over the past ten seasons. The Chicago White Sox have averaged 215. The Twins head to Chicago to play a three game series against the White Sox on Friday night before returning to Minneapolis to play their first regular season game at Target Field against the Boston Red Sox. For more articles by Zeke Fuhrman, check out his articles on Bleacherreport.com, Vikingsmix.com, and Landof10000aches.com.